The climate change that is expected in the coming years, place intense pressures on consumers around the world as this means only one thing, more energy and fuel are needed to control the environment and make homes more comfortable. More food will be needed to feed the already exploding population and with the production of more food comes the use of more energy sources. Over the years, new technology has been invented to improve our living standards - energy saving devices are not excluded. However, new technology always comes at a high price at first, but the prices will begin to drop after some time. Instead of waiting around for the more affordable energy saving devices, we can all do our part with saving energy at home by taking small easy steps. Once we get use to the small changes we've made, we will be able to move on to bigger changes and it won't seem so hard. Don't ever feel like the little things we do won't make a difference, because you are oh so wrong. Every little action taken by people all over the planet accumulates, just like the snow ball effect, into a gigantic action that does make a difference. As much as 85% to 90% of electricity or gas consumption can be saved when you turn the dial of your washing machine to cold and only wash in cold water. Heating the water consumes a lot of energy. One more thing. a front loading, energy star washing machine saves you 50% on water and 50% on energy. They also do not have any phantom loads. A phantom load is something that uses power even when it is not being used. Replace old clothes dryers with a new energy star appliance. As with the energy star washing machines, they are now designed to save on electricity, which will end out paying for itself as it saves you money and helps to save the planet. Don't use a dryer at all. Hang your clothes on a clothes line outside. You will save 20% off of your electric bill by not using the dryer. I bought an energy star dryer that I only use during the winter. I am in the process off setting up a line drying area in the basement to use during the winter time too. I personally have saved $25 a month by hanging my clothes out to dry rather than using the dryer and as an added bonus, the clothes smell so much fresher, and the sheets feel better on the bed. *Always try to avoid "phantom" energy users. We have already discussed turning down the home and garage thermostats, on the home page, but this is one more step that can be taken that will make a difference in your electric or gas bill. Heating water in the home is the third largest energy expense in the home. 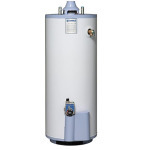 On the average, most people have a water heater that hold about 40 gallons of water. Unknowingly, most of us keep it maintained at a constant very hot temperature. Keeping that forty gallons of water that is sitting in your tank blazing hot all the time consumes a lot of energy. The thermostat on the water heater doesn't need to be at a blazing hot temperature all of the time. In fact it never needs to be above 120° F. during the summer as it is really warm enough to be comfortable and clean dishes. During the winter, if you have below zero temperatures, like we do in the northeast, you could turn it up to 150°. The manufactures usually have it set between 160° and 180°. When on vacation, and the water heater won't be in use for a while, it is advisable to maintain it at an even lower temperature. Draining a quart or more of water from the tank every month or so, will remove sediment that has collected in the bottom of the tank. This is another energy saver as sediment impedes heat transfer and lowers efficiency. If you have an older, less energy efficient water heater, adding insulation around your hot water heater can lower the cost of running it by 15% with this simple task. You can buy the hot water heater insulating blankets at any home improvement store such as Home Depot or Lowe's. Incidentally, if you are in the market for a new water heater, you can now buy "on-demand, energy saving, instant heating units" that will heat water only when it's needed. Popular in Europe, these electric or natural gas-powered water heaters save energy by only heating the water that's being used, and not keeping water hot all the time and waiting to be used. The on-demand water heaters can run anywhere between $700 to $1,200, depending on the brand and model. According to manufacturers, depending on the brand, they are capable of heating enough water for three to eight showers at a time all day long. It's possible to have one of these on-demand water heating units near the shower, or you could have one larger unit serving the entire house. This is something to check into if you are in market for a new water heater. Another alternative that will save a lot of money heating the water is to build your own solar powered water heater! You can read a little more about it on the DIY home Energy Page. Make sure that all home plumbing is operating correctly and that you don't have any leaks. Repair faucets that are leaking by replacing rubber gaskets. If you have leaking toilets or toilets that keep running, repair them immediately or replace with a new energy efficient toilet. You can by kits to replace the inside tank workings at any home improvement store for around $30. If the toilet is leaking at the base, it is a little tricky for a DIY job, but if you are handy at these types of jobs it can be done. Get an estimate from a plumber to do the repair and compare the cost of the plumber to the cost of replacing the toilet with a new one and installing it yourself. Take into consideration of how much you will save monthly on your home water bill by getting a new energy efficient toilet. Take showers instead of baths. The average shower uses 17.2 gallons of water, 25 percent less than a bath, which uses 24 gallons of water. When brushing your teeth, turn the water off instead of leaving it running. Turn it back on when you are ready to rinse your mouth and the tooth brush.